In January 2005 it became apparent to us that we were losing our battle with cancer for our beloved “Golden Girl” Molly, but we hoped that by getting her a puppy it may give her a new lease on life so on January 16/05 we braved an ice storm and traveled to Abbottsford to seek out a little golden boy to join our family. 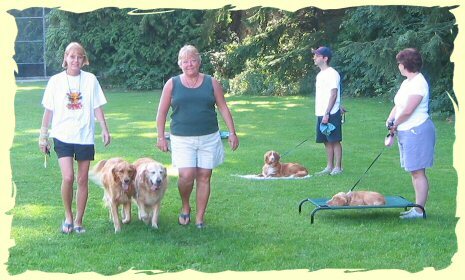 Golden Retrievers are smart, loving, gentle and obedient…or at least that was our experience. We found Kasey and he was without a doubt the most adorable little ball of golden fluff that we had ever seen and so we bundled him in our arms and brought him home. Unfortunately, the next day we had to say good-bye to Molly and Kasey was there to love us and help us through that sad, sad time. He was 7 weeks old and everything we hoped for, for at least two weeks. THEN THE “FUN” STARTED! His high energy became less cute as his puppy biting began to take it’s toll on our arms, legs, in fact any part of our being that came within range. His “grandma’s” dog, Flyer, an American Cocker didn’t want to visit any more as he got flattened by Kasey every time he came in the house and we were reduced to running around the back yard with a broom in our hands, yelling “Get out of the garden and stop eating the plants!” All in all, despite having one of his moms with him 24/7 it was proving exhausting. We had done Obedience previously with other dogs that we have owned but found the methods too aggressive and came across Jeff’s Sit Happens on a friend’s website. 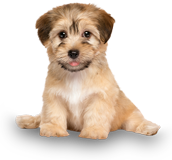 When we contacted her she had nothing but good things to say about him and his training methods so we contacted Jeff and he came to our house for a free in-home consultation. It was an amazing experience. We had a demonstration by Jeff’s dog to give us a preview of what life could be like with a well trained dog and Jeff’s confidence, quiet demeanor and obvious love and respect of dogs sold us on the spot. Within 24 hours, our little rambunctious puppy had turned a corner. He was still full of life and energy but we could now enjoy him as his problem behaviors were quickly under control. We no longer had to be careful with our body parts and anyone, two or four legged, could visit with confidence that they would not get bowled over by a flying ball of golden energy. Even the plants in the garden breathed easier. We completed the in home sessions and were totally excited to participate in the “real world” outdoor classes. Kasey quickly was off leash and under control and there has been no looking back. 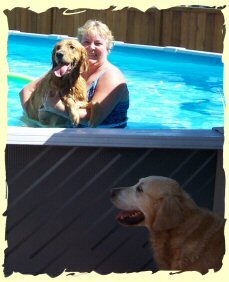 In fact, things were so good with Kasey that we had no reservations about rescuing another Golden in April. We introduced Max into the family and Kasey couldn’t have been happier. Max was rescued from a situation of neglect. He was totally overweight (our neighbor said that he looked like a “Hummer”) and he had no training or even knowledge of language. He loved to go for a walk on leash but almost tore our arms from the sockets as he charged ahead with his own agenda of where we should be going. 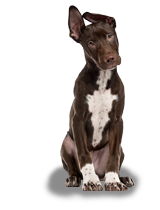 Without hesitation we called Sit Happens to do the in-home consultation and set up the training plan. Max joined class and proved to be a stubborn old coot that still wanted to do what he wanted, when he wanted. It wasn’t long however with the soft voices and consistent training for him to become what we like to think of as the perfect dog. In fact, we call him either Maxell Smart Dog or Max Does No Wrong Dog. 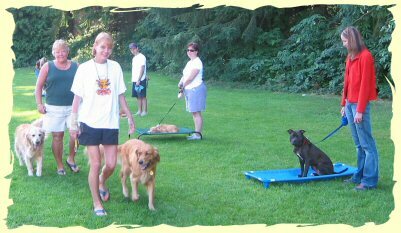 None of this would have been possible without the training for us and for the dogs that has been provided by Jeff at Sit Happens. Our boys are happy and healthy and can be off leash, running in the park or on the dykes while still being totally under control. Our voices are never raised in frustration and we are constantly being complimented on how well behaved they are. They have made two best friends (as have we) at school and it is not unusual for one of us two legged owners to have all four dogs out, off lead and under control. Max has lost 20 lbs and as for Kasey – Shrek once said “Change is good, donkey” and we are in the position now of saying “Kisses are good, puppy”. We are all happy and confident to be out in the “real world” together and this training has allowed our boys to enjoy life to the absolute fullest. 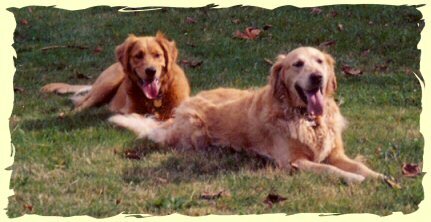 They both are what all Goldens are supposed to be – smart, loving, gentle and obedient. 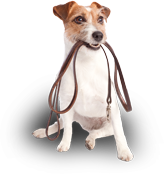 The biggest problem that we now have is never knowing where our leashes are, as we have no real use for them. Even getting up for a 9:00 A.M. class on the weekend is something that we all look forward to. Thank you Sit Happens, you have allowed us a wonderful life together.